We're all for taking that next big road trip, buying that round-the-world ticket, and diving with whale sharks. But we're allergic to the term "bucket list." That said, when we flipped through The Bucket List: 1000 Adventures Big & Small, we were pleasantly surprised with the sheer variety of unique ideas and blown away by the incredible photos of stunning landscapes and events — many in spots we've heard little to nothing about. The book is divided along longitudes and latitudes, with a helpful corresponding webpage linking to coordinates of all 1,000 tasks. A thousand is a lot — daunting, even. Start below with a half dozen of our favorites, excerpted from the book. 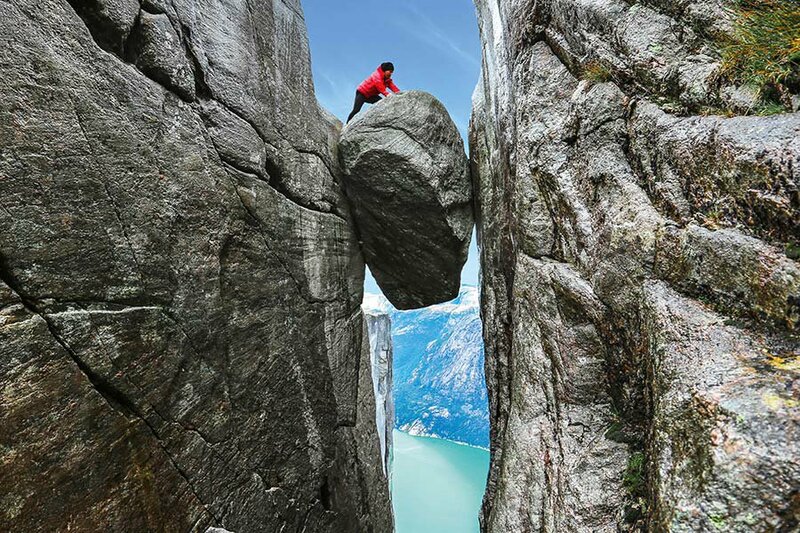 Wedged in a mountain crevice on the edge of Kjerag mountain, the Kjeragbolten boulder is suspended over a near-3,280-foot high drop. It's accessible, after a hike, without any climbing equipment — simply jump up onto the large rock for a very memorable photo op. Giant's Causeway. Photo by Tonnaja Anan Charoenkal. Take in all six counties that make up Northern Ireland on the mammoth, 625-mile circular walk that is the magnificent Ulster Way. Opened in the 1970s, the project's aim was to take long-distance hikers through some of the most beautiful scenery the Northern Irish countryside has to offer. 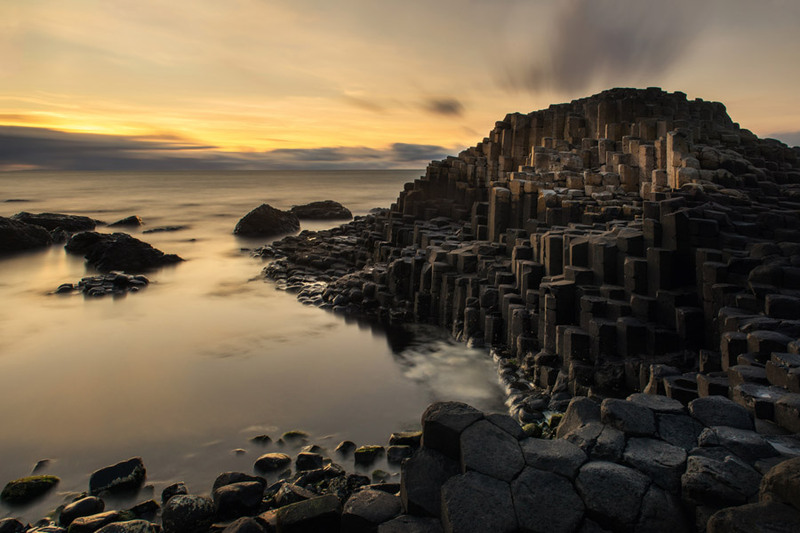 The most popular place to start is the curious Giant's Causeway, with its ancient stone "steps," which jut out in the sea of the country's northern coastline. Oma Painted Forest. Photo by Melba Photo Agency. A stroll through the peaceful Oma Painted Forest amid colorful Monterey pine trees is a feast for the senses. 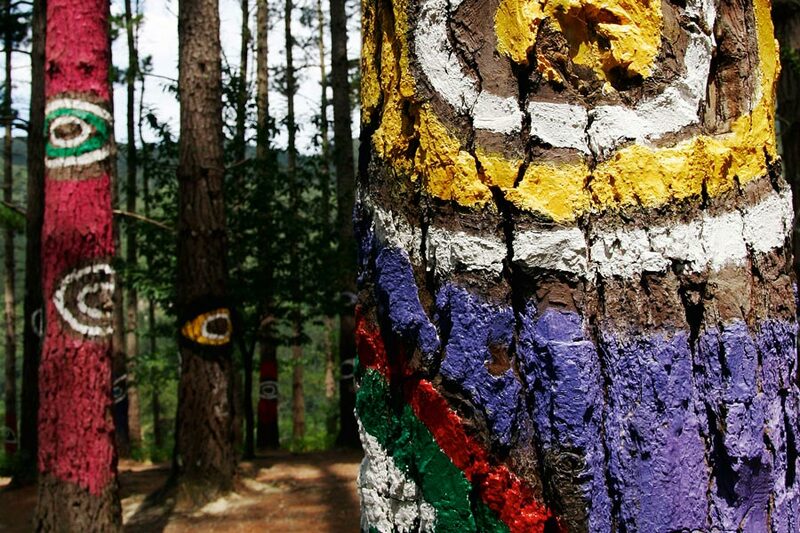 In the 1980s, sculptor and artist Augustín Ibarrola painted unique patterns on the tree trunks here, some of which change shape and perspective as you move through the forest. This open-air museum is a form of "land art" — where nature is used as the artist's frame — and features artwork representative of nearby Paleolithic cave art. Ukai is best seen from May to October. Photo by The Asahi Shimbun. Charlie Chaplin was said to have been a fan of Ukai, fishing with cormorants (a kind of waterbird), a 1,300-year-old Japanese tradition similar to falconry. 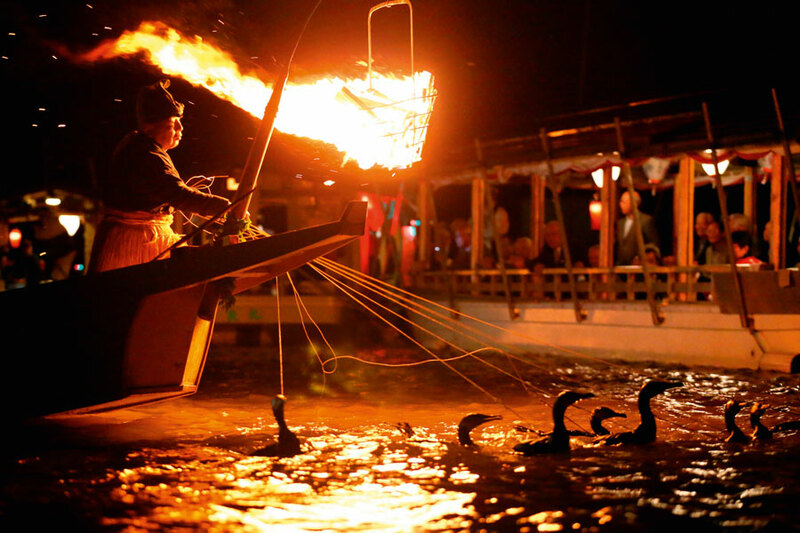 Performed at night, with sake flowing, the fishermen manipulate both the water, trapping the sweetfish in the shallows, and ten to twelve cormorants at a time. A double-decker bridge in Nongriat village. Photo by Amos Chappel. Created from rubber tree roots guided across rivers by the Khasi tribe of northern India, the living-root walkways can support up to fifty people. 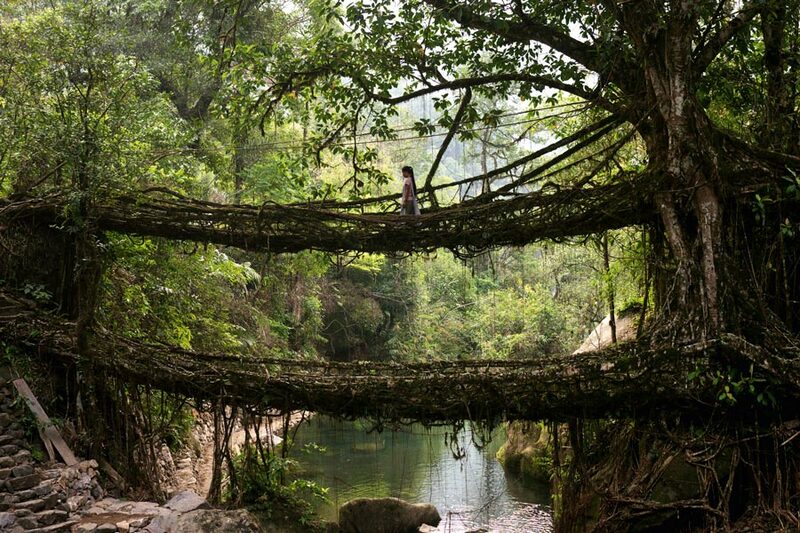 Marvel at the double-decker bridge in Nongriat village, in the Cherrapunji rain forest. The end of the rainbow is in Mauritius. Photo by Konstik / iStock. Feast your eyes upon the colored earth of Chamarel, a vision so bizarre, it feels almost like an optical illusion. 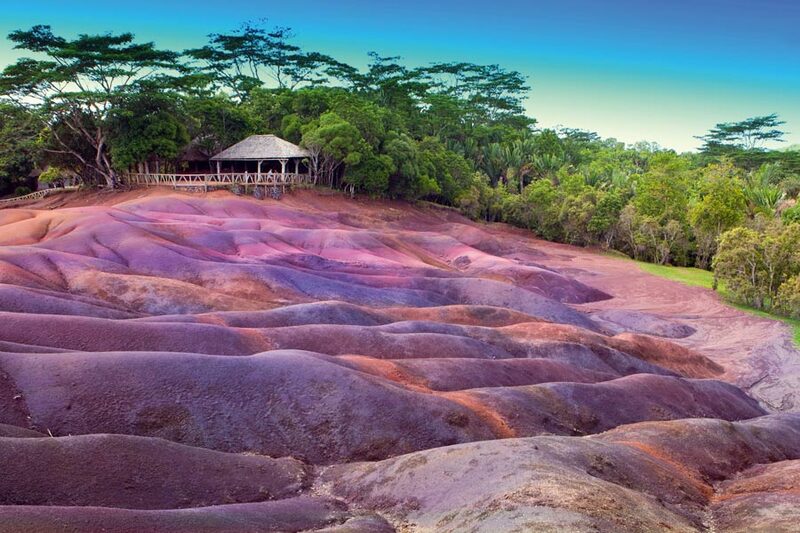 Rolling dunes of rainbow-colored earth in the Rivièra Noire District of Mauritius have been formed by the weathering of volcanic rock and the minerals within it, creating a mind-bending pastel rainbow backdrop. There are 994 adventures to go! I Want to Road Trip Across America. What Route Should I Take? Excerpted with permission and modified for length from © The Bucket List: 1000 Adventures Big & Small edited by Kath Stathers, Universe Publishing, an imprint of Rizzoli New York, 2017. Kath grew up in the Middle East, has traveled extensively in South America, and now lives and works as a writer and editor in London. Follow on Twitter at @kathstathers. She travels for the big and small adventures.